We engage kids of all ages through interactive and educational school experiences. See us perform our show tailored just for elementary kids in the above video. We have shows available for elementary through college level and one specifically for music students. I am pleased to highly recommend an excellent and informative assembly we recently enjoyed at Kathy Caraway Elementary. The musical group was Will Taylor and Strings Attached, and they played a wide variety of songs for our students and staff members. The band performed for 45 minutes for our primary students and then an additional 45 minutes for the intermediate students. Will and his band were adept at being about to taylor (pun intended) their presentations for these two different age groups. It was evident that these musicians had an excellent rapport with students, and they shared pertinent and fun information about various types of music and instruments. 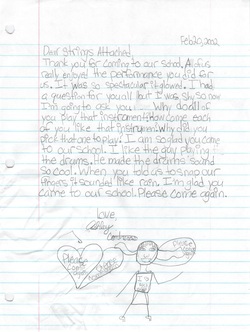 They utilized a wide variety of musical vocabulary terms to enrich their program. The presentation was very interactive, and staff members shared with me that it was well worth the time spent out of the classroom. If you would like additional information, I can be reached at 512-464-5504 or shelly_hohmann@roundrockisd.org. Will Taylor: Burning "bad" violins to bring music to Texas foster kidsThis is one of the most unusual benefits ever, by one of the most unique music groups ever. My friend Will Taylor and Strings Attached will burn BAD violins on Friday night, April 29 at Nutty Brown Cafe to bring awareness to National Child Abuse Prevention Month, and Kids In a New Groove. 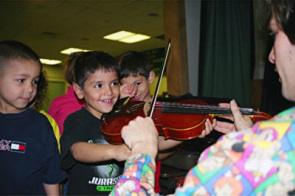 KING provides musical instruments and instruction for Texas children in foster care. Will is donating part of the profits from his Classic Rock Weekend concert series to KING, and promoting the donation of playable instruments to the non-profit program.